On Thursday morning we arrive at the Immigration office in the Hillsborough Police Station shortly after 8 AM. The immigration officer is perched on the sidewalk in front of the office. He advises that the office is being cleaned and asks us to return in ten minutes. 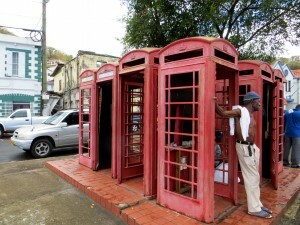 With his permission, we explore the downtown before clearing Grenada Customs and Immigration. Shops and restaurants on Main Street are just beginning to open their doors for the day. There are a few shops geared towards tourists, but Hillsborough is largely an unspoiled seaside fishing village. Today is the final inter-island passage of the winter voyage of Cutter Loose. 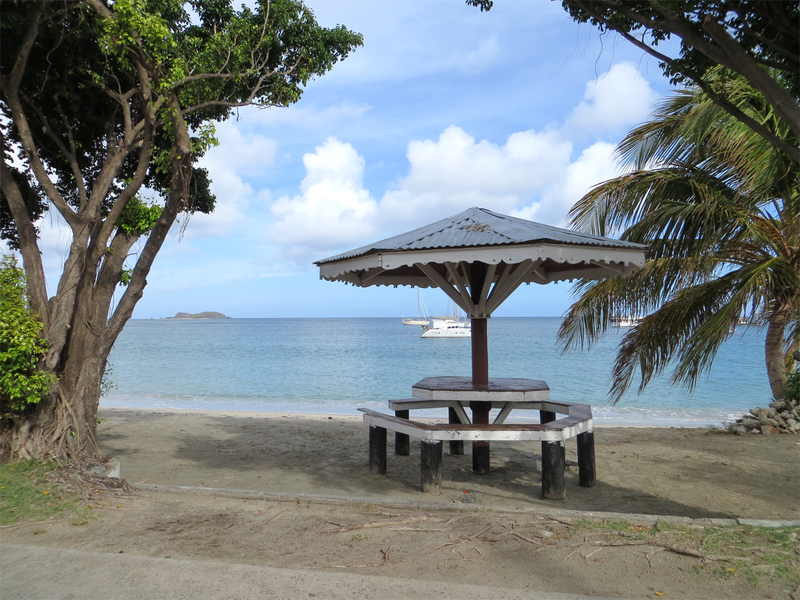 We depart Hillsborough on the island of Carriacou at 10 AM and set sail for Grenada, the Spice Island. Our destination is St. George’s, some 32 miles to the south. 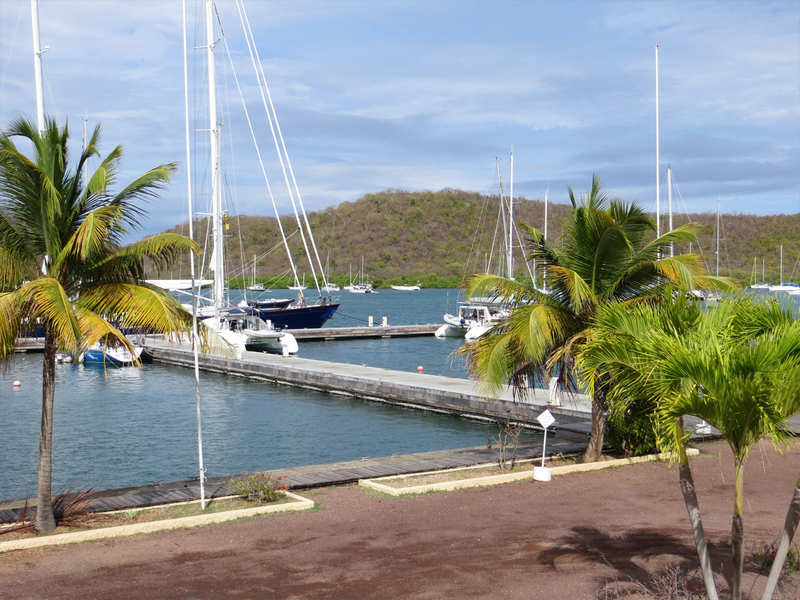 Unlike most days in the Windward Islands when the easterlies are blowing 20+ knots, today is a day for relaxed sailing with 10 to 12 knot winds on the quarter. It is as if we are seniors in high school during those last few easy-going days before graduation. The exams are over. Our college plans are set. We are coasting to the finish line making 4 to 5 knots over ground on a gentle broad reach…plenty of speed to make St. George’s by late afternoon. The anchor is down at 5 PM near Ross Point in the outer harbor at St. George’s. Actually, this anchorage is more of an open roadstead than a harbor. Our objective for the weekend is to become familiar with St. George’s so that we will be able to provision the boat next December when we return here to begin another season of cruising. The wind all but disappears overnight, replaced by a slight swell from the north. In the absence of wind, Cutter Loose is riding to the tide. At mid-tide, the swell is on the beam, creating a rolly motion and some sleepless moments in the forward cabin. 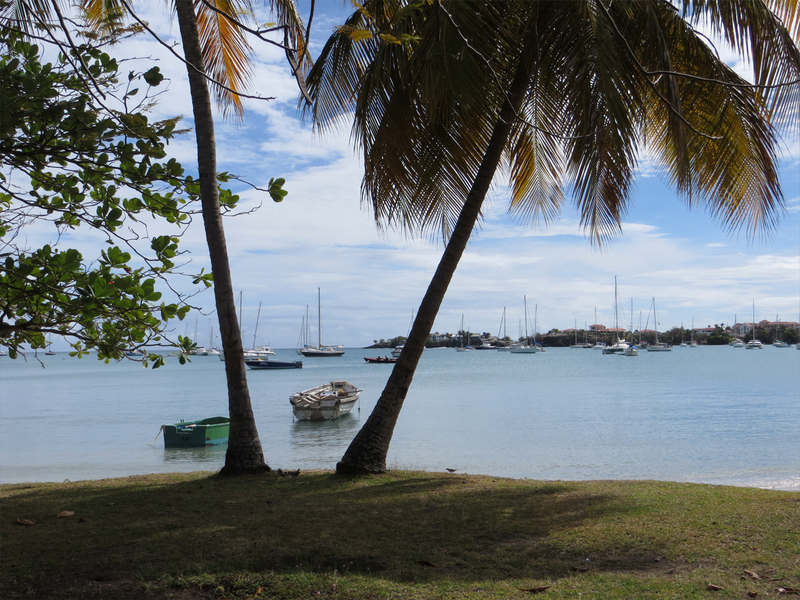 On Saturday morning, we take the dinghy into Port Louis Marina to explore old town St. George’s. 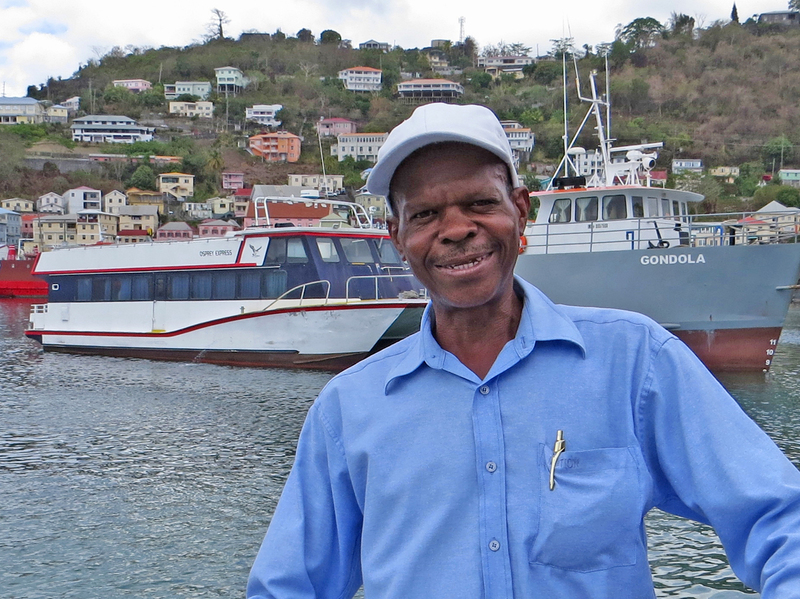 While walking along the waterfront, we are intercepted by Herman, a well-dressed and polite middle-aged gentleman who introduces himself as the “information officer” of St. George’s. 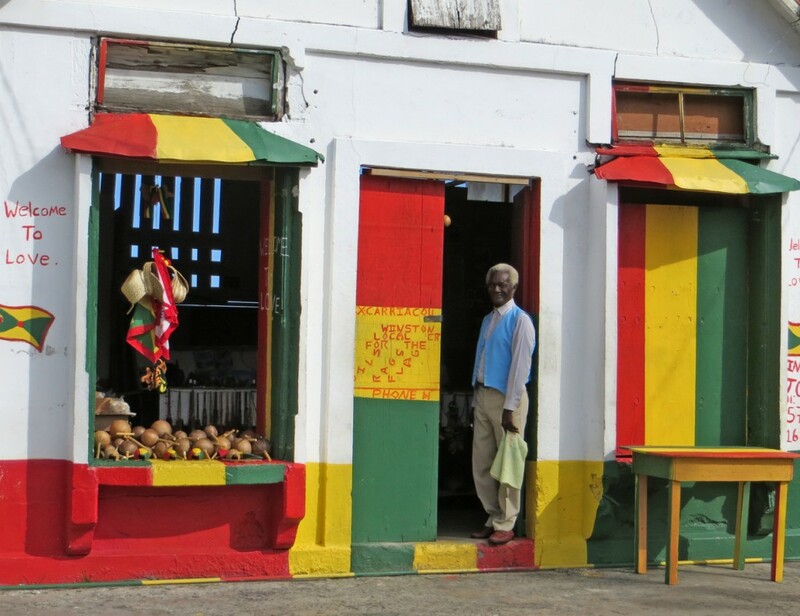 Walking with us, he asks if we are enjoying Grenada. Within a few minutes, he is into full guided tour mode. Herman never hints that there will be a fee for his services. Unlike the boat boy in Clifton, Herman is warm and friendly and eager to please. He leads us past the fort to the cruise boat shopping area. But there are no cruise boats today. The cruise boat season has ended. Local guides must snare cruising sailors in order to put food on the table. 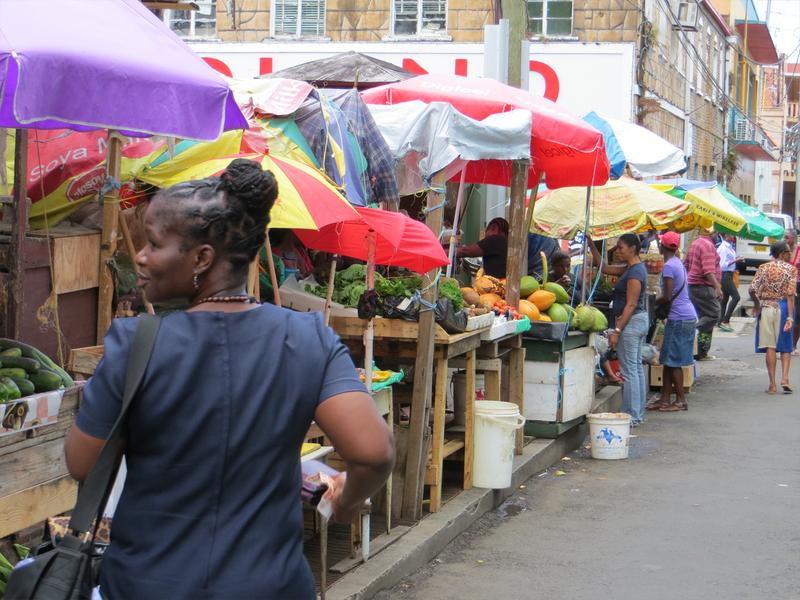 Herman treats us to a full-fledged tour of the open air public market and the fish market. We pause for lunch at a cafeteria-style Creole restaurant where the cricket game on the television has captured the attention of patrons. Herman corrects our misguided interpretation of the Japanese-financed fisheries complex on the waterfront in St. George’s. Japan’s motive is NOT to purchase fish from local fishermen. Japan financed this structure to gain Grenada’s support for unrestricted whaling. 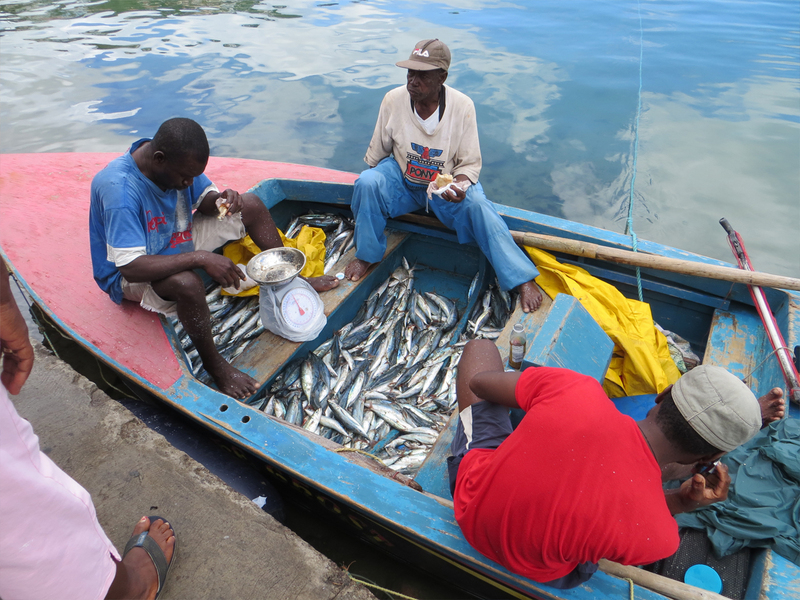 Apparently, there is an international fisheries organization whose members determine where various types and locations of fishing are permitted. 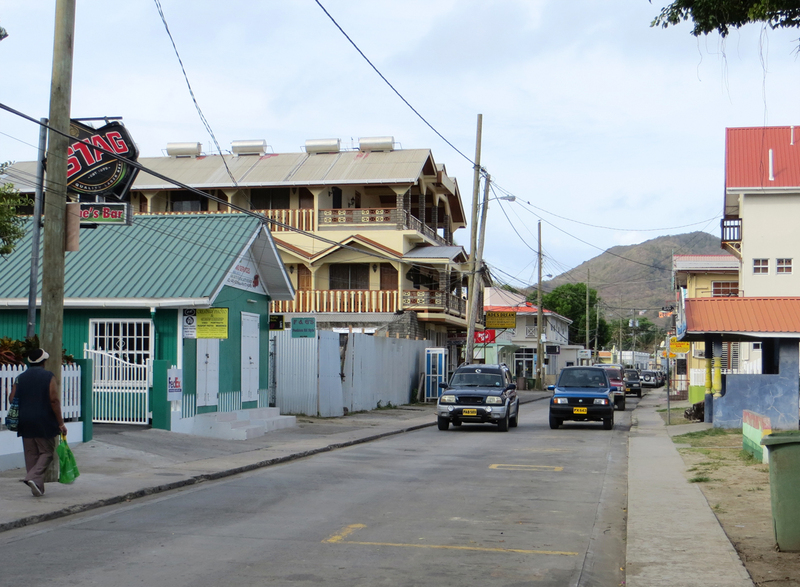 By financing the fisheries complex in St. George’s, Japan bought Grenada’s vote in support of unrestricted whaling. Our time with Herman comes to an end as we must move Cutter Loose to a more protected anchorage. We compensate him for his services and bid him farewell. The anchor is up at 2 PM for the short hop from St. George’s to Prickly Bay on the south coast of Grenada. En route, we briefly cross below 12 degrees north latitude, the southernmost point of our winter cruise. In the island vernacular of Jimmy Buffet, we have arrived in those “little latitudes”. Prickly Bay is a southern suburb of St. George’s and a haven for cruising boats. 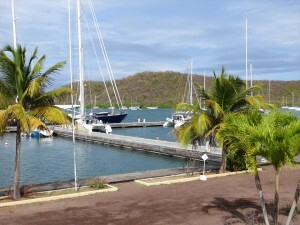 At the head of the harbor is Spice Island boatyard, Prickly Bay Marina, a few restaurants and a Budget Marine chandlery. From here, it is a ten minute bus ride to Spiceland Mall in the Grand Anse suburb of St. George’s. 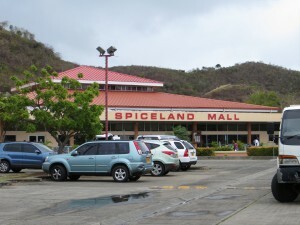 Several U.S. style grocery stores are located in or near the mall, as are several resorts and the long white beach at Grand Anse. Learning our way around this shopping area will pay dividends in December when we return here to provision Cutter Loose from scratch. A short distance from our anchorage in Prickly Bay lies the campus of St. Georges University (SGU) . 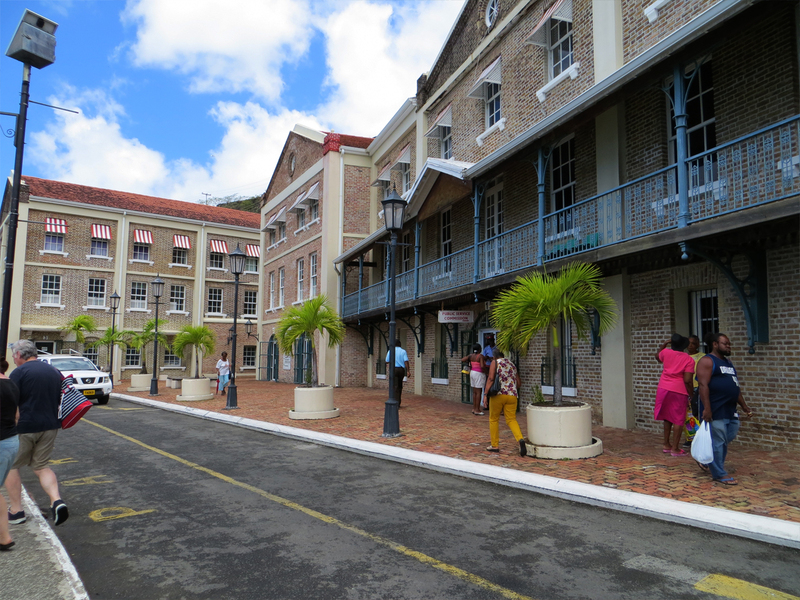 SGU offers degrees in medicine, veterinary medicine, public health, nursing and business. With an enrollment of 5,000 undergraduates plus 8,000 post graduate students and an academic staff of 850, SGU is a major economic force in the region. University buses transport students from the campus to the shopping district. 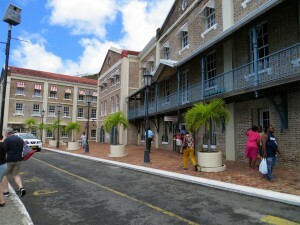 SGU played an important role in Grenada history. 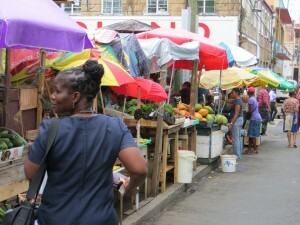 In 1979, a Marxist coup forcibly overturned the government of Grenada during which time President Eric Gairy was forced into exile in the United States. At that time, the University was in its infancy. All told, there were 1,000 U.S. citizens in Grenada when President Ronald Reagan launched Operation Urgent Fury in 1983. The reason given by the Reagan Administration for the invasion of Grenada was the evacuation of American medical students at St. Georges University, four years after the coup. Grenadians were amazed to witness air strikes and the arrival of U.S. landing craft on the pristine beaches of this tiny tropical island. Apparently, the enemy consisted of a small number of Cuban soldiers clustered in a rural area of the island. 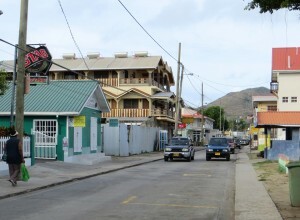 Many Grenadians still hold the United States in high regard as a result of Operation Urgent Fury. 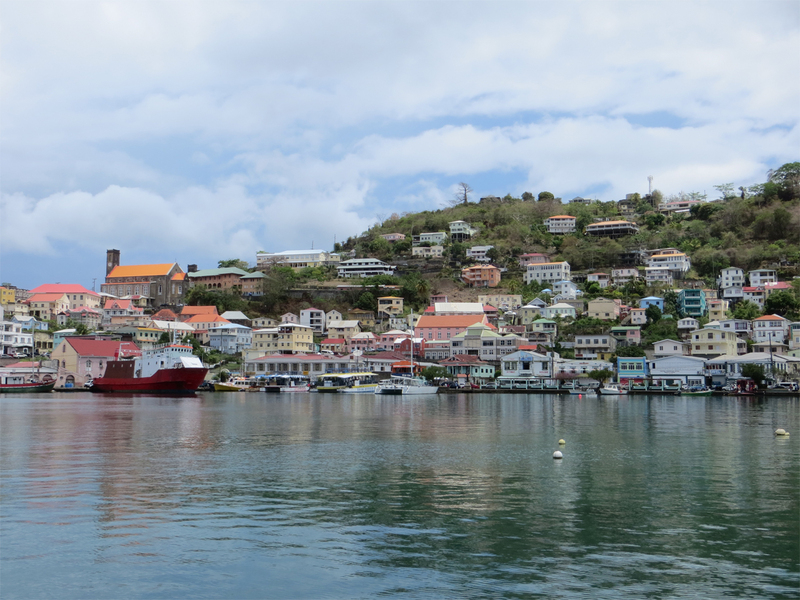 Grenada is boat-friendly and fond of Americans. 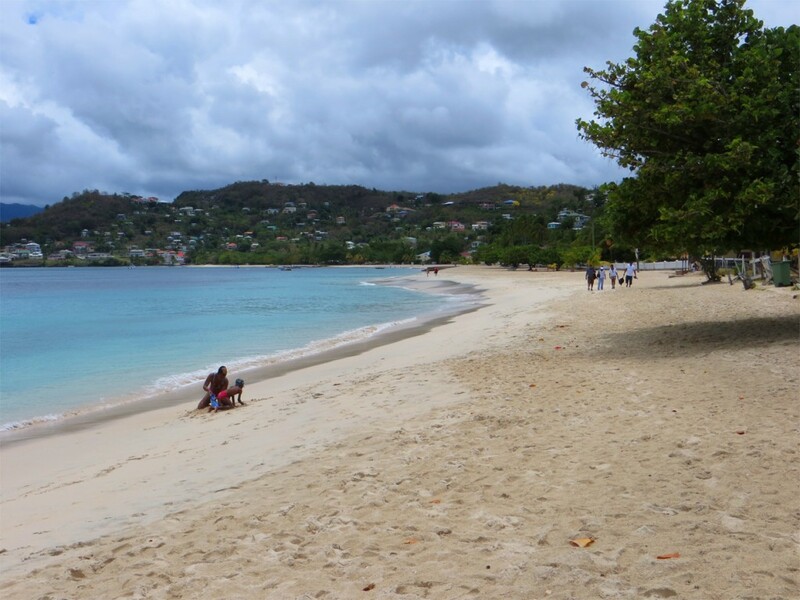 The south coast of Grenada is a series of bays, each offering pristine protected harbors. This is prime cruising territory. 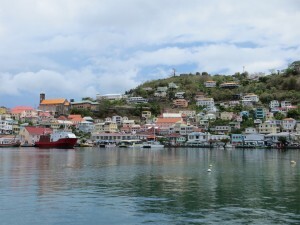 Many cruising sailors spend the entire season on the south coast of Grenada. From Prickly Bay, it is a 30 minute walk through a neighborhood of upscale homes to Secret Harbor Marina in Mount Hartman Bay. The restaurant at the marina serves as the social hub for cruisers docked at the marina and anchored in the harbor. When we arrive on Sunday, cruisers are playing Mexican train dominoes and talking about the schedule for live music at nearby restaurants during the coming week. Many of them return to Mount Hartman Bay year after year. On Monday, we will move on to La Phare Bleu Marina to begin the process of preparing Cutter Loose for summer storage. Before the work begins, we will enjoy one final night of relaxation on the hook in Prickly Bay.